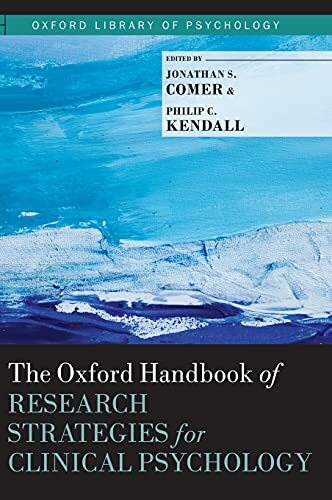 [PDF] The Oxford Handbook of Research Strategies for Clinical Psychology (Oxford Library of Psychology) | Free eBooks Download - EBOOKEE! Description: Mental health problems impose a staggering worldwide public health burden. Regrettably, whereas many sciences have been progressing for centuries (e.g., biology, chemistry) it is only recently that the strategies of science have been applied to the field of clinical psychology. At this relatively early stage in the science of clinical psychology, the majority of work is ahead of us, and as such the prepared investigator must be familiar with the full portfolio of modern research strategies-a set of 'directions' for getting from 'here' to 'there.' To continue to move the science of clinical psychology forward, investigators benefit when they systematically rely on research strategy "routes" that achieve favorable balances between scientific rigor and clinical relevance. With this need in mind, The Oxford Handbook of Research Strategies for Clinical Psychology has recruited some of the field's foremost experts to explicate the essential research strategies currently used across the modern clinical psychology landscape that maximize both precision and significance. Chapters in this volume address design, measurement, and analytic strategies for clinical psychology, including comprehensive coverage of: - effective laboratory methods in experimental psychopathology, single-case experimental designs, small pilot trials, the randomized controlled trial, adaptive and modular treatment designs, and dissemination methods and models - change measurement, observational coding, measurement of process variables across treatment, structural and functional brain imagining, and experience sampling data collection methods - statistical power, correlation and regression, randomized clinical trial data analysis, conventions in mediation and moderation analysis, structural equation modeling, meta-analytic techniques, item-response theory, and the appropriate handling of missing data. The book concludes with an integrative summary of research strategies addressed across the volume, and guidelines for future directions in research methodology, design, and analysis that will keep our young science moving forward in a manner that maximizes scientific rigor and clinical relevance. No comments for "[PDF] The Oxford Handbook of Research Strategies for Clinical Psychology (Oxford Library of Psychology)".